The drama surrounding her email started well before the presidential campaign. Hillary Clinton’s use of a private email system rather than a government-run account while serving as secretary of state has been a major sticking point throughout the presidential campaign. The recent news that the FBI had relaunched its investigation into her email use added another chapter to this multi-year saga, during which questions had been repeatedly raised about what rules she may have broken. Here is a full timeline of Clinton's history with email, the federal guidelines that theoretically applied to her when she took office, and the events of this week. Hillary Clinton was recorded telling a donor that she didn't like using email. 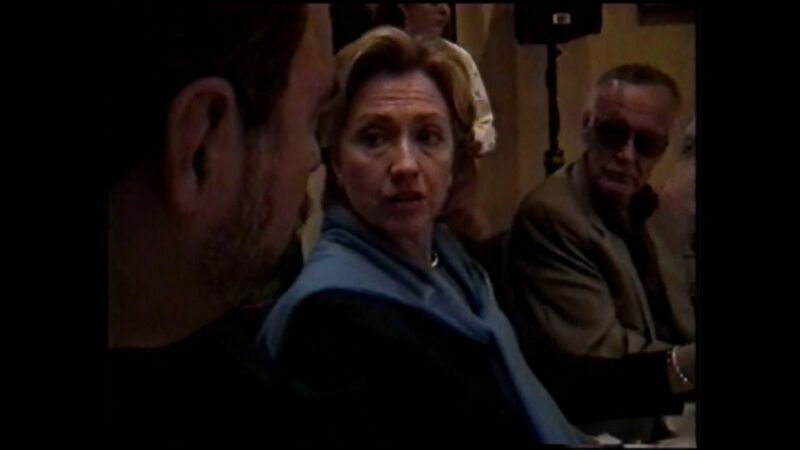 Home video footage from 2000, shot at a fundraiser by a donor, Peter Paul, showed then-Sen. Clinton talking about how she had chosen to avoid email for fear of leaving a paper trail. "As much as I’ve been investigated and all of that, you know, why would I? -- I don’t even want -- Why would I ever want to do e-mail?" Clinton said. "Can you imagine?" she asked. Clinton made the comment during a private luncheon when she was a Senate candidate. The Foreign Affairs Manual was codified by the State Department, which ruled in 2005 that employees could only use private email accounts for official business if they turned those emails over to be entered into government computers. That ruling also forbade State Department employees from including "sensitive but unclassified" information on private email, except for some very narrow exceptions. In the midst of the 2008 presidential race, Clinton took a jab at the Bush administration's use of non-governmental email accounts. "Our Constitution is being shredded. We know about the secret wiretaps. We know about secret military tribunals, the secret White House email accounts," Clinton said in a 2007 campaign speech. 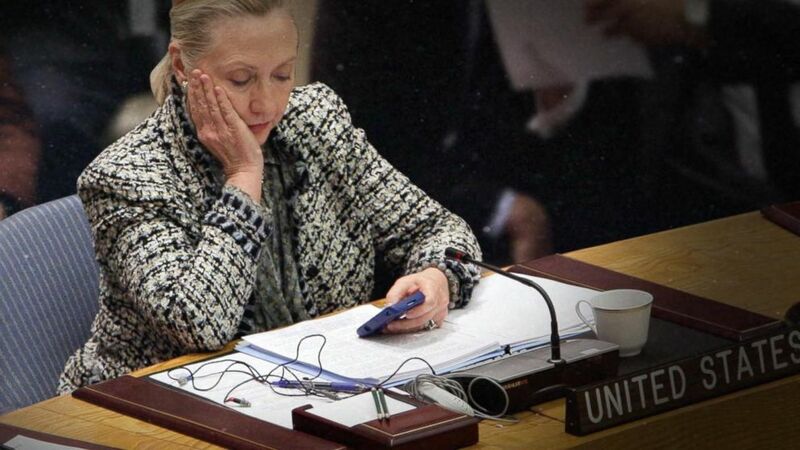 The former secretary of state tweeted earlier that she wanted the public to see her emails. Much of the mystery surrounding Clinton’s emails came from the fact that an IP address associated with the clintonemail.com domain she is believed to have used was registered to a person named Eric Hoteham on Feb. 1, 2008. No public records matching that individual can be found and it is possible that it was simply a misspelling of the name Eric Hothem, a former aide to Clinton while she was first lady. An Eric Hothem is now listed as an employee at JP Morgan in Washington, D.C. The IP address for clintonemail.com, along with others registered in Hoteham’s name, are all connected to the Clintons' address in Chappaqua, New York. Justin Cooper, a longtime aide to former President Bill Clinton, registered the clintonemail.com domain on Jan. 13, a little more than a week before Clinton took office as secretary of state on Jan. 21. 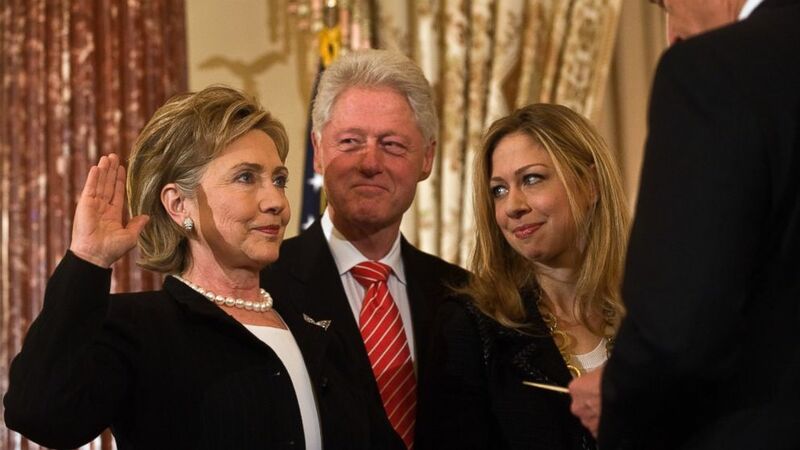 (AFP/Getty Images) US Secretary of State Hillary Clinton is ceremonially sworn in by Vice President Joe Biden as her husband former president Bill Clinton and daughter Chelsea look on at the State Department in Washington, Feb. 2, 2009. Questions remain about what the National Archives considers an “appropriate agency recordkeeping system” and if they believe Clinton, who did not hand over any emails until last year, was in compliance with it. Clinton was not the only one in the diplomatic service to use a personal email account, but it appears that someone else got in trouble for their habit. As part of a 2012 report by the Office of the Inspector General, the then-Ambassador to Kenya Scott Gration was reprimanded for using private email and other issues. The report suggested his "use of commercial email for official government business" amounted to a failure to "adhere to department regulations and government information security standards." 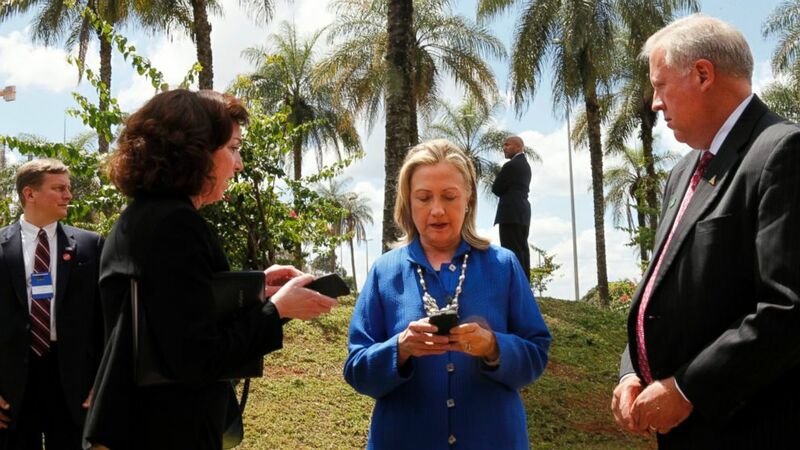 (AFP/Getty Images) Secretary of State Hillary Rodham Clinton writes on her cell phone with Roberta S. Jacobson, left, and Thomas Shannon in Brasilia, Brazil, April 17, 2012. Clinton stepped down from the State Department on Feb. 1. President Obama signed the Federal Records Act into law in late November, requiring the head of each agency to "make and preserve records containing adequate and proper documentation of the organization, functions, policies, decisions, procedures and essential transactions of the agency." The realization that Clinton’s emails were not recorded at the State Department appears to have been made in two steps. According to a timeline from the New York Times, first, the congressional committee investigating the Benghazi attack asked the State Department for all relevant emails. At that point, the State Department asked for Clinton to turn over all of her non-personal emails from her time as secretary. She handed over 55,000 pages of emails late in 2014. The State Department also asked other former secretaries of state to turn over government-related emails for preservation. The New York Times reports that, in mid-February, Clinton handed over more than 300 emails to the House committee investigating the Benghazi, Libya, consulate attack. Clinton’s use of a private email address did not become public knowledge until the New York Times reported on it Tuesday, March 3. Clinton’s team insisted she acted in the spirit of the laws governing email use. After growing pressure, Clinton asked the State Department to release her emails. At a March 2015 news conference at the U.N., Clinton said that after she left office, "the State Department asked former secretaries of state for our assistance in providing copies of work-related emails from our personal accounts. I responded right away and provided all my emails that could possibly be work-related, which totaled roughly 55,000 printed pages, even though I knew that the State Department already had the vast majority of them. We went through a thorough process to identify all of my work-related emails and deliver them to the State Department." During an interview with ABC News’ David Muir, Clinton said the use of two separate accounts was "a mistake." "What I had done was allowed, it was above board. But in retrospect, certainly, as I look back at it now, even though it was allowed, I should've used two accounts. One for personal, one for work-related emails. That was a mistake. I'm sorry about that. I take responsibility. And I'm trying to be as transparent as I possibly can to not only release 55,000 pages of my emails, turn over my server," she said. Previously, she had told MSNBC's Andrea Mitchell that she was “sorry that this has been confusing to people and raised a lot of questions." In a debate with Sen. Bernie Sanders in New Hampshire, Clinton said she had "absolutely no concerns about" the investigation. "I never sent or received any classified material," she said. On Saturday, July 2, Clinton "gave a voluntary interview" to the FBI that was "about her email arrangements," according to a statement from her spokesman Nick Merrill, and the interview lasted about three-and-a-half hours. The next day, Clinton called into NBC's "Meet the Press" and said that she had "been eager to do it and was pleased to have the opportunity to assist the department in bringing its review to a conclusion." On July 5, FBI Director Comey said its investigation could not "find a case that would support bringing criminal charges," though there were several areas where Comey made it clear that Clinton and her team mishandled her email. 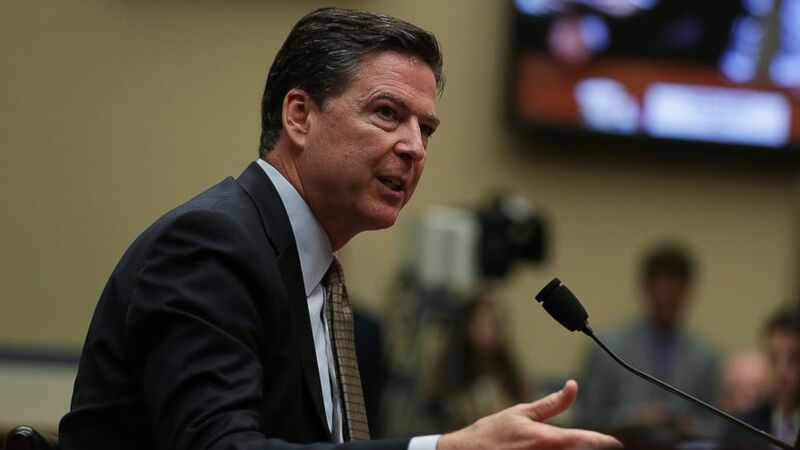 (Alex Wong/Getty Images) FBI Director James Comey testifies during a hearing before House Oversight and Government Reform Committee, July 7, 2016 on Capitol Hill in Washington. Comey said that 110 emails in 52 email chains were determined to contain some form of classified information at the time they were sent. He went on to specify that Clinton was on seven of those chains that were classified as top secret. “There is evidence that they were extremely careless in their handling of very sensitive, highly classified information. For example, seven email chains concerned matters that were classified at the top secret, special access program at the time they were sent and received," Comey said. Comey released a statement today, just 11 days before the election, saying that the FBI is going to continue the previously closed investigation into Hillary Clinton's emails from her time as secretary of state. "In connection with an unrelated case, the FBI has learned of the existence of emails that appear to be pertinent to the investigation," Comey wrote in a letter released today. Comey wrote in the letter that after being briefed on the unrelated case, he agreed, "the FBI should take appropriated investigative steps designed to allow investigators to review these emails to determine whether they contain classified information, as well as to assess their importance to our investigation." "Although the FBI cannot yet assess whether or not this material may be significant, and I cannot predict how long it will take us to complete this additional work, I believe it is important to update your Committees about our efforts in light of my previous testimony," reads the letter to the leaders of various congressional committees. Donald Trump opened a campaign rally in New Hampshire shortly after the release of the letter, announcing the news to cheers. "Hillary Clinton's corruption is on a scale we have never seen before. We must not let her take her criminal scheme into the Oval Office," Trump said. He praised the FBI's decision to revisit the case. "This was a grave miscarriage of justice that the American people fully understood," Trump said. "Perhaps finally justice will be done." Comey issued his second letter to Congress in nine days, this time informing lawmakers that the review of emails from Anthony Weiner's computer was complete and that the investigation did not change the FBI's July conclusion that there was no prosecutable offense committed by Clinton or her team of advisers. Clinton campaign communications director Jen Palmieri said she was "glad this matter is resolved." Trump, however, pushed back against the announcement. "Right now, she is being protected by a rigged system," Trump said Sunday night at a rally in Michigan. "It’s a totally rigged system. I’ve been saying it for a long time. You can’t review 650,000 new emails in eight days. You can’t do it, folks." ABC News' Jonathan Karl, Devin Dwyer and Mary Bruce contributed to this report.